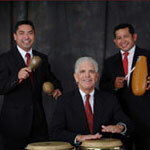 Pachanga, A New Latin band located in Hilton Head Island, SC ...what everyone has been asking for!!! A three piece band, they are lead by Juan on drums, Jesus on Keyboards, and Fuzzy on Congas. They play several styles of Latin music like: salsa, merengue, cumbia, rock, baladas, pop, bolero, etc. The music they play is 100% Latin and good to dance and enjoy (fun), although they are not a mariachi or norteño band, but play some norteño and some mariachi music. They play songs of Ricky Martin, Thalia, Sonora Santanera, Sonora Dinamita, Willie Colon, Oscar de Leon, Mana, Santana, Celia Cruz, Los Fabulosos Cadillacs, Kumbia Kings, Selena, Paulina Rubio, Shakira, Bronco, Buenavista Social Club, etc. They prove to be real professionals in the selection of the music they play. They feel their music is for everybody, conventions, country clubs, family parties, outdoor events, rehearsal dinners etc. A very entertaining group, PACHANGA. Loved, LOVED Pachanga!! I will definitely like to have them again for a similarly themed event. They were just wonderful – very professional and great sound. Thanks! !